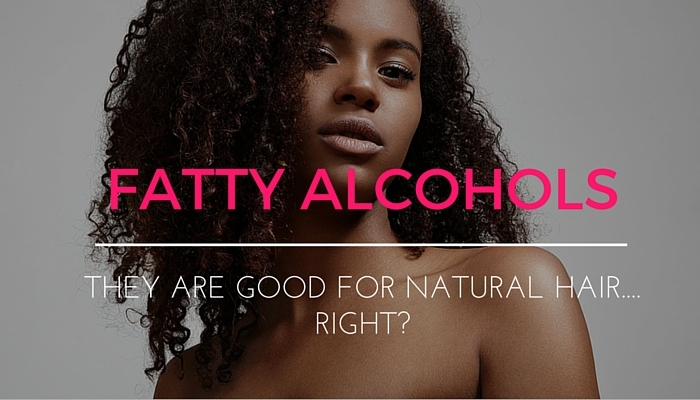 Are Fatty Alcohols Actually Good For Natural Hair? Are fatty alcohols good for natural hair? It depends. It is true that fatty alcohols are an improvement over short short chain alcohols like SD alcohol, alcohol denat and isopropyl alcohol. Fatty alcohols like cetyl alcohol, cetearyl alcohol and stearyl alcohol – just to name a few – tend to have lubricating properties that in the short term, seem to make hair more pliable and more flexible. In contrast, short chain alcohols are extremely lightweight and very drying. Additionally, these alcohols break up oils that they come into contact with. That is precisely why they are so pervasively used in hair products that are marketed for people who have oily hair. Unfortunately, short chain alcohols are also prominently featured in African American and natural hair care products, rendering hair that is already naturally dry and non-pliable even more dry. Seeking an alternative that resulted in fewer tangles, I decided to use bentonite clay and aloe vera gel to cleanse her hair for a while. The tangles definitely decreased, but her hair just never felt thoroughly clean. So after using an organic clarifying shampoo that was also alcohol free, I shopped around and decided to try a cleansing conditioner that contained lots of good stuff – but cetyl alcohol was the first ingredient in its ingredient list. I used it for the first wash, and her hair felt amazing. With each subsequent wash, however, I began to notice a definite change in the texture of her hair. Instead of feeling soft and supple, it gradually began to feel hard, wiry and extremely dry. Sadly, every wash with the cleansing conditioner amplified these results. I looked at the ingredient list again and noticed that, even though the product contained a nice amount of moisturizing ingredients, it contained much more cetyl alcohol than moisturizers. Remember, fatty alcohols may make your hair feel good for a while by providing lubrication, but they do NOT add moisture to the hair. In other words, they do not nourish hair or even replenish lost moisture that very dry natural hair needs. The bottom line? Buy products that have a low percentage of fatty alcohols in their ingredient lists. After all, at the end of the day, alcohol is alcohol.